Paragon is located at Orchard Road between Bideford Road and Mount Elizabeth Link. It is directly opposite Ngee Ann City. How do you get to Paragon? The entrance of the car park is on Bideford Road. If you are coming from Orchard Road, please keep left once you see Paragon and turn left into Bideford Road. Once in the car park, try to park your car near Tower Lobby. Valet parking is available. Alternative parking is available at Cairnhill Place multi-storey carpark on Bideford Road (next to Paragon) or at Ngee Ann City on Orchard Road (directly opposite Paragon). There are plenty of taxis available at Paragon. The Paragon taxi stand is along Bideford Road. 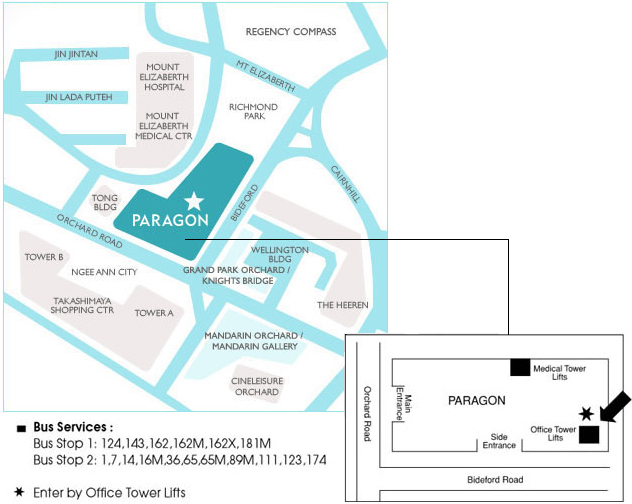 Paragon is located between Orchard MRT Station and Somerset MRT Station. It is an easy 5 minute walk from both stations. How do you get to our clinic once you reach Paragon? After reaching Paragon, proceed to the back of the shopping centre on the ground floor and turn right to the Office Tower lobby. Take the lift at the Office Tower lobby (not the Medical Suites lobby) up to level 15. Our clinic is the first one on the right. Please do not hesitate to call our friendly staff at 6333 8108 if you need assistance.